Hello and welcome to the Mamalogues Blog! This is the home for longer pieces about the pleasures and pitfalls of pregnancy and parenting by members of the Mamalogues community. We always aim to give you the best advice on a range of topics that we struggled to find information on during our own journeys in pregnancy and parenting. Enjoy! Check out the Mamalogues YouTube channel for new videos every Tuesday. Whenever a friend asks me for pregnancy advice, “Exercise!” is my go-to answer. On more than one occasion, my enthusiasm has been met with a dubious smile or exhausted stare. And I completely get it. I remember how utterly wiped out I felt during my entire pregnancy. But I can’t help myself. I’m convinced that exercise was the magic ingredient keeping me from falling apart – at times mentally, at times physically – during my pregnancies. You may already be doing some guesswork about the kind of person I am. Let me assure you – I am not someone who grew up a natural-born athlete. As a middle schooler, I tried to be a sprinter because I thought it meant I’d have to do less running. In college, I started running to counterbalance the large quantities of cheese fries and ice cream on which I subsisted. I started running even more in grad school to manage stress and to make up for the half a pizza I could polish off in a sitting. And yes, I run even more now, and yes, I eat less pizza (because I have to share it with my kids), but I am by no means a fitness guru. Nevertheless – I am a big fan of exercise during pregnancy. Here are a few of the reasons it made a big difference for me. Exercise gave me some time to myself. When I was pregnant with my second son, I had a two-year-old at home clamoring for my attention. Those naps I had enjoyed during my first pregnancy? Those hours of watching TV with my feet up? Yeah, that never happened second time around. One of the best ways for me to actually hear myself think turned out to be exercising. For me, that often meant running. Sometimes it meant walking. Sometimes it meant yoga. Regardless, when I was exercising, I was doing something good for myself and the little guy in my abdomen, and it often gave me the space to mentally decompress that I needed. Exercise alleviated some of my pregnancy aches and pains. I was lucky to have two healthy, low-risk pregnancies, but that does not mean that I felt great all of the time. For example, the larger my belly grew, the greater the pain in my low back – a dull, persistent ache that left me squirming in my office chair. But pelvic tilts – one of the simplest exercises out there – almost instantly made the pain go away. Some days, I would head into the bathroom at work and take a few minutes to merrily tilt away. Was it worth the occasional awkward run-ins with colleagues? You had better believe it. Exercise empowered me. I happened to be in pretty good shape at the start of my second pregnancy, so with my OB’s approval, I kept running throughout the whole 42 weeks (you read that right). There was something about weaving belly-first through the throngs on the Wildwood Boardwalk that made me feel like a total badass (even though I’m glad there’s no video footage). And when I logged a few miles on a treadmill on my due date, I felt more confident about my impending labor. Whenever I was feeling anxious during my pregnancies, exercise always helped me to feel like I was in control. Exercise helped me mentally prepare for labor, delivery, and everything that followed. Remember how I said I was in good shape at the start of my second pregnancy? My first pregnancy was a different story - when I found out in August that I was expecting, I had just gotten back from an amazing road trip that involved LOTS of eating. My first trimester was hot and uncomfortable, and my feeble attempts at running left me feeling drained. I ended up turning to prenatal yoga, which was a game-changer. I learned yogic breathwork (pranayama) and poses that strengthened parts of my body that I would need for labor. I practiced mindfulness that helped carry me through some pretty agonizing Pitocin-induced contractions and later helped me cope with sleepless nights as I attended to my crying infant. Also, I was able to practice prenatal yoga in my living room, thanks to a great selection of classes available on what continues to be one of my favorite websites – YogaDownload.com. Exercise during pregnancy motivated me after pregnancy. Taking care of a newborn (or a newborn and a toddler) is exhausting and time-consuming, and makes showering – let alone exercising – seem impossible. Because I was used to making time to exercise during my pregnancies, however, I was able to make it a priority to resume exercising once I had recovered from delivery. All of the benefits I had experienced when I exercised during pregnancy – getting some personal space, feeling healthy and in control – continued after I had my babies. And while it took way longer than I had hoped it would, I did eventually lose my baby weight. Exercise probably helped with that, too. 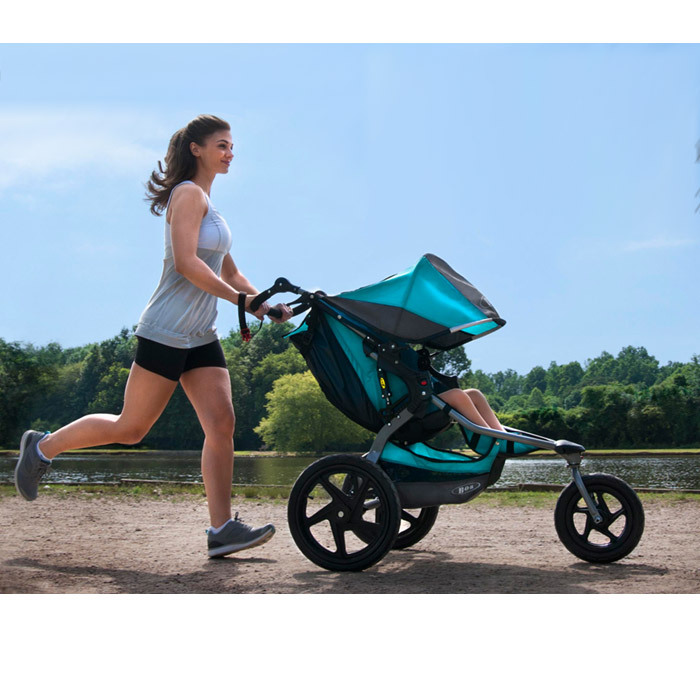 So now that I’ve made my case, I’ll dish out my usual pregnancy advice – while you’re expecting, consider making exercise a regular part of your self-care! Of course, you should talk to your doctor or midwife before you begin any new fitness program, and be sure to set reasonable goals and limits for yourself. I wish you and your baby a happy, healthy pregnancy!